Prime Minister Binyamin Netanyahu on Tuesday, 5 Adar, toured IDF Southern Command headquarters. He received a security briefing; Defense Minister Moshe Ayalon, IDF Chief-of-Staff Lt.-Gen. Gadi Eizenkott and Southern District Commander Major-General Sammy Turgeman. The prime minister used the opportunity to get his message out regarding the Hamas threat from Gaza. Mr. Netanyahu stated “Even after Hamas took the severest blow in its history, we are continuing to monitor its activities and we are prepared for any and all developments. I came here with the Defense Minister in order to be updated by the IDF on our deployment and on our possibilities for future action. “It must be understood that Hamas, Islamic Jihad and all the other terrorist organizations are acting with the full support of Iran, which has openly declared its intention to destroy the State of Israel. “To my regret, the information which has reached me in recent days greatly strengthens our concerns regarding the agreement being formulated between the major powers and Iran. This agreement, if indeed it is signed, will allow Iran to become a nuclear threshold state. That is, with the consent of the major powers, Iran – which openly declares its intention to destroy the State of Israel – will receive a license to develop the production of bombs. 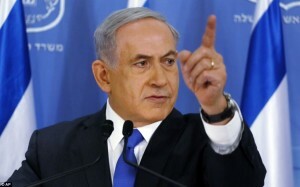 enough posturing and finger wagging Bibi! time to drop the “big one” on Iran. Anyone agree?